Once again I'm participating in Vintage Thingie Thursday! 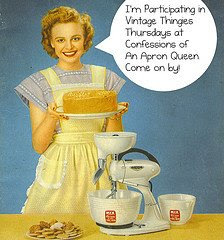 If you would like to participate, visit Confessions of an Apron Queen! and join us. I love to see your vintage stuff! I have some treasures I haven't had a chance to unpack since moving to Texas last year, but this week I'm mixing it up a bit with something that isn't an antique, but it's vintage to me. Others might think it's a bit goofy, but I love it. My middle daughter gave it to me for Christmas twenty years ago. She knew I would love it and I do. That's right, it's Alf! or The Alfonator! I apologize for the classy shade, which is a cheap plastic mixing bowl. It will have to do for the purpose of pictures...hopefully it doesn't take away from the perfect image of the character himself....The Alf. By the way if the bowl looks familiar, it's because my astronaut wore it too. The lamp has markings like a real antique...sort of. It was made under copyright by Alien Productions, 1988. Does anyone know if Alf ever caught that cat on the show? And why on earth was Alf cancelled? I was surprised and pleased to see Alf on the Fox New Network, being interviewed by Bill O'Reilly. It was nice to see Alf's intellectual side. 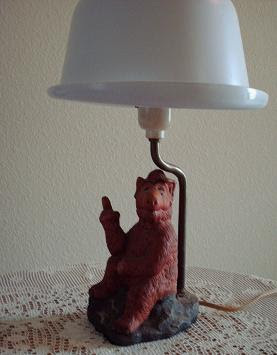 So there you have it....my vintage Alf Lamp.....Long live Alf! I used to love me some Alf. In my first apartment after I graduated college, I had a poster of Alf. I bought my kids an entire season or two of Alf on dVD and they love it. An Alf lamp is definitely vintage, and potentially highly collectible. The plastic bowl? Not so much. I loved Alf. So cool. I love me some alf!!! No, I don't think he never got the cat. Somehow I missed Alf along the way. But he does make a cool lamp! LOL too funny! 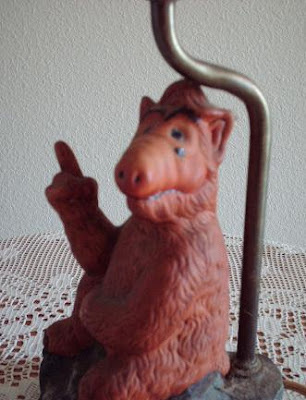 I had this hidious Alf watch when i was little. It was furry and huge and velcroed around my wrist. I think the plastic mixing bowl lamp shade is a keeper!! hahahaha! 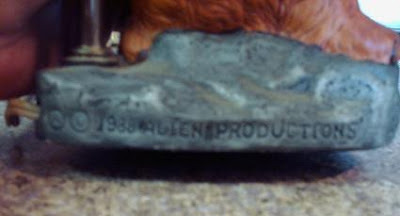 My daughter had Alf slippers....they were so cute! I recently found one wedged in my son's closet- long lost for 19 years! I am enjoying reading about Alaska! P.S. Don't forget to get your picks in. I just made reservations at the Rainforest for 6:30pm. Let me know if that works for you, they also had 6:00. Big Brother Update!!! Ignore if you are on the West Coast and want to see it "semi" live! Yesterday Jerry lost in round 2 with Memphis...8 minutes to over 51 minutes. 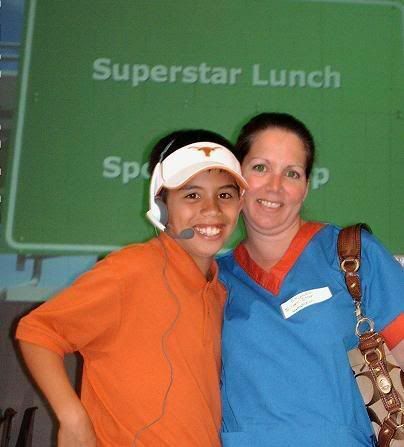 Tonight Memphis lost the final HOH to Dan. Dan evicted Jerry. Go Dan!!!! Grandma J, I watched a east coast feed online, because I don't think I will still be awake when it airs here. Sunday's show seems like it will be moments that happened. Tuesday we will find out who the winner is. Go Dan!!! 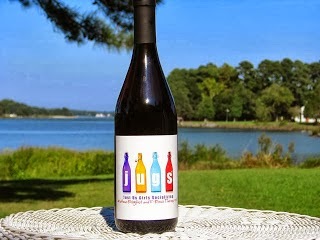 Hoping you are a big winner gambling! I hate for your cruise to end. BTW after reading Kristie's post I ordered some of that fudge online. Funny because I am not much of a sweet eater. Glad you are enjoying yourself, but, I had a nightmare that you got a tattoo....state of Alaska inked onto your lower back....promise you wont do that! see you in CA soon! Um, we have your calendar...but not sure when you are arriving on the 16th...in the morning? or at 3:00 to pick up Beauty? what? Also, we decided to do Sea World on the 2nd (per your Calendar date, marked "Theme Park") Will drive down early in the am, eat breakfast with Elmo...are you staying here that week? And, to top it off, the captain borrows your phone....GJ, use this time to meet some girlfriends, find some quilters or something, lay off the gambling, drinking guys! NO TATTOOS...no piercings, dont show up on my door with hickeys....I MEAN IT!! I almost forgot to mention that I've bumped into Kristie three times this week. Crazy but it's mostly going into the dining room. How she keeps her girlish figure is beyond me because the variety, quantity and quality of the food is out of this world. The ship is really rocking tonight,so I have to quit typing but I have tons of pixels from glacier bay to share at a later date. I even got one calfing which means a big chunk came tumbling down falling in the ocean. chow! OMG...Alf! I haven't thought about him since 1980! That is so funny! I haven't thought of him for years. That's when sitcoms w/ canned laugh tracks were still funny. I am so out of the blog circut...and I've missed you...but not because you have gone...but I have. I never knew what to think of Alf when I was little. I thought he was funny and sorta cute, but then he always wanted to eat the cat (I actually don't know if that is true or if I just made it up in my kid brain). As a child, it was quite difficult for me to comprehend the character who wasn't all good or all bad, so I always felt secretly confused about him.